Buy Kerbal Space Agency a Coffee. ko-fi.com/kerbalspaceagency - Ko-fi ❤️ Where creators get paid by fans, with a 'Buy Me a Coffee' button. No one cared much about space until a huge asteroid came along and nearly wiped out kerbal civilization. The majority of those that survived developed a deep respect and curiosity about the heavens. Returning to the surface as the planet recovered from cataclysm, the yearning for space exploration increased when evidence was found of advanced beings having visited the planet during the centuries spent underground. The kerbals may have been ignorant in the past, but they are now determined to overcome what differences remain in their society and step forth into the endless expanse to discover their place in the cosmos. Join us on our journey to leave this planet and venture out among the stars! 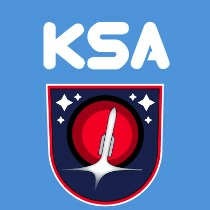 The KSA conducts regular daily operations as we push forward in technology, knowledge and achievements. Our twitter feed provides succinct up-to-the-minute reports on all news and activities. Our website provides a source for extended communication as well as a collective resource for followers to reference all past news and activities. Our Operations Tracker lets you see in real-time the status of our crew and all ongoing missions, location of known celestial objects, planetary surface maps, past missions, and more. The ultimate goal is to explore the Kerbol system, and perhaps beyond, to try and determine why an alien artifact turned up on the planet surface. It's not just a simple matter of mission success or mission failure - legal/political wrangling, religious differences, financial factors and more all contribute just as much to the story that is gradually evolving towards that end. The public's support in this endeavor through the donation of funds (1USD = 1000Funds) will help see it through the harder times. Regardless, we will remain dedicated to exploring for answers, wherever they may end up being found. Secured Payments. Support goes to Kerbal Space Agency's account. Upgrade Kerbal Space Agency to a yearly Gold Membership with a one-time payment.